Behind the post office in town the bats have arrived, into a sparse camphor canopy. Much fanning during the hour I observed them. I have not seen them in this spot of camphor’s in previous years. Many flying foxes have died in Queensland, thousands according to news reports. Here too, a change. Many more flying foxes have arrived in the Moreton bay fig trees. Next to my sleeping space so sleep interrupted by their screeching, snapping, argueing as dried branches fall from the trees. The night sounds are dominated by their woosh as they fly over the cabin, to the drama of the feeding space the figs provide. Usually there are a couple who live here all year, I hear them chattering to each other some nights. Now I must try and record. 5 minutes of rain, now I have to sweat it out. Bats, glow-worms, fluro fungi and a man spraying. Ah… the bats…A second flowering of the majestic yet sappy, blue fig, flowering for the second time this spring and autumn, have brought the bats back to a less hostile environment. They keep me awake, as they decimate the Quandong. 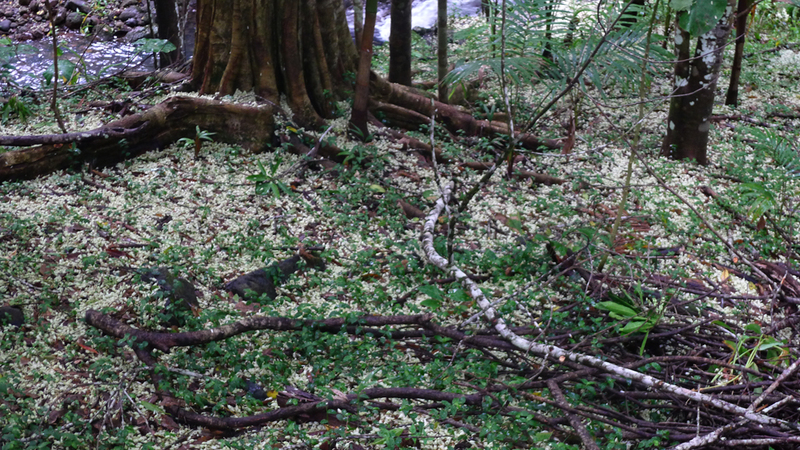 This morning, walking out before day-light, I stumbled over a carpet of flowering branchlets. Fluorescent fungi, glow warms guided me down the track. A log, semi submerged in the fast running water. Illuminated, full length with glowing fungi, reflected in the ripple and swirl of the receding flooded creek. Looked like a miniature Titanic, ablaze with light as it slowly sunk. A magic moment for me……….a minute or two worth sharing. 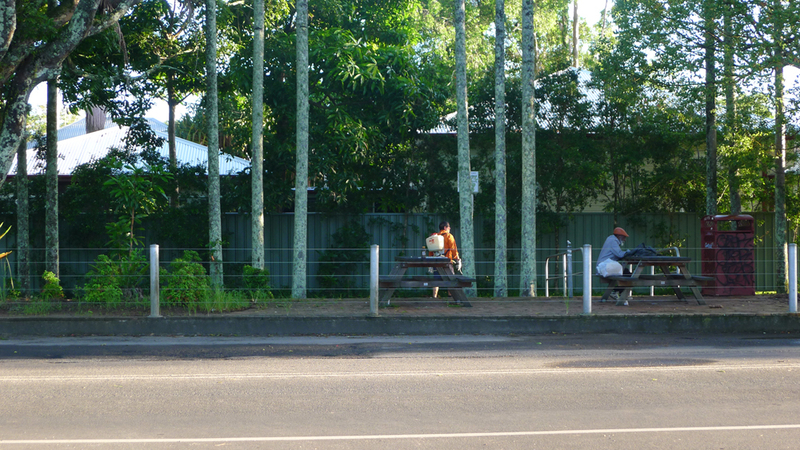 But soon disillusioned, as soon as I got to Mullumbimby viewed a man with a spray pack on his back. He told me he was spraying round-up/ No protection, he said he doesn’t breath it in. He also said he had to complete his round before too many people were around. 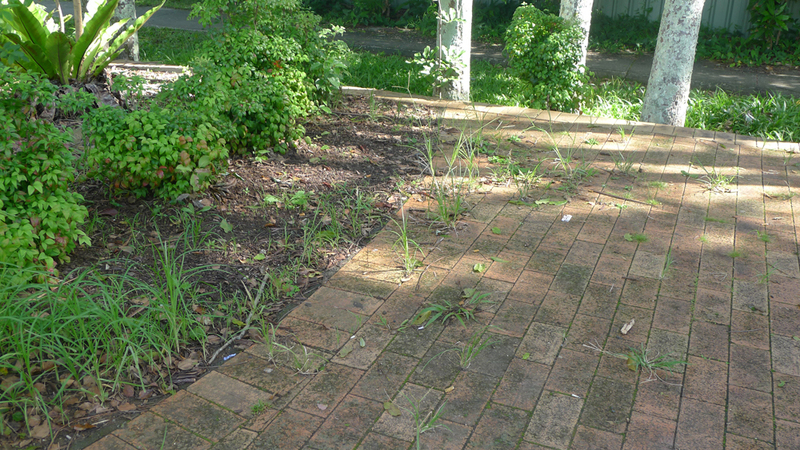 Single sparse leaves. A public space. And what was being sprayed.